11/2''wide black imported English Bridal leather belt with filigreed old antique silver type buckle with roped edges. 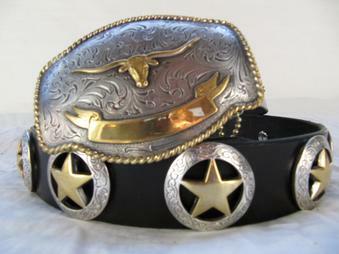 and longhorn steerhead in contrasting gold finish with silver & gold combo style conchas with cut out Texas stars. Also comes with leather cleaning and conditioning kit.Very few ever made.